I was studying at Pratt Institute as the architectural movement postmodernism was coming to an end. The movement, or architectural style, is largely attributed to Robert Venturi’s approach to architecture in his 1966 book Complexity and Contradiction in Architecture. His concepts having been applied so poorly by lesser architects, I was happy to attend the style’s funeral. However, the ideas Venturi, who retired this week, set forth in that text and in the 1972 treatise Learning From Las Vegas, co-authored with Denise Scott Brown, were critical game changers in architecture. Modernism, in all its abstract glory, ruled the post-war era as the elegance of its proportioned geometry and its celebration of materiality eventually gave way to banal pragmatism. Venturi sought a away to bring culture back to the equation through the lens of history and by applying the teachings of Louis Kahn and the regionalist ideals of Aalto. In Learning from Las Vegas, Venturi taught us to evaluate and encourage the cultural conditions of a site prior to design rather than to neglect them. The garish, vernacular, electrified signage and linear, car-driven nature of the Las Vegas Strip are the emergent result of the competitive casino culture. While the designer George Nelson may have been appalled by the Strip’s visual illiteracy when viewing it in snippets, in its totality it is a spectacle. The recognition that it is a spectacle and its subsequent celebration elevates modern culture. Moreso when the complex and the contradictory results are amplified into a larger spectacle, as exemplified by the work of Rem Koolhaas, Herzog and De Mueron, Jean Nouvel, MVRDV, BIG and other contemporary architects. Nouvel’s seminal Arab World Institute in Paris, created at the birth of postmodernism, is indebted to the theories advanced by Venturi. With its facade of motorized Arab motifs, it is a total embrace of Arab vernacular design positioned in a contemporary context. The Neues Museum in Berlin, recently renovated by David Chipperfield, carefully preserves and showcases the history of the building through the context of its war-torn finishes and years of neglected features. One also can trace Venturi’s impact from beloved American urban destinations such as Times Square, to the preservation of Wildwood, NJ, and even to our own South Street (with all of its literal and figurative fronts). Venturi has shown us the value of context and culture and that complete urban plans often look great from above, but work poorly when enacted. His writings teach us to leave gaps in those plans, to accept accommodations from the surrounding site, and to embrace inherent meaning and variety. A self-described Catalyst, Jason Lempieri investigates subversion, history, and collective memory in his work. He designs from the perspective that form follows meaning. 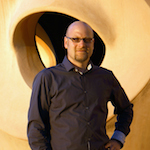 He is the founder of the multi-disciplinary architecture and design studio RethinkTANK llc. Currently, he is raising public funds for Gilded Gates, an artfully designed bike rack at Rittenhouse Square endorsed by the Bicycle Coalition of Greater Philadelphia.